For many Americans, the road to recovery after a major surgery can be paved with speed bumps and frustration. Once the operation is complete, medications and therapy may be needed to help restore patients back to their optimal speed. Being able to keep up with this new influx of medication times and altered meal plans can put a lot of strain on patients and their families. Mission Medstaff can be a helpful resource in the recovery phase for a number of reasons. We’ve offered quality home health care to Greensboro residents and beyond for years. With an obsessive attention to detail, Mission Medstaff provides comprehensive adult and pediatric home care services to North Carolina residents with a focus on the individual. No two people are the same, and our highly-trained staff knows it. As one of the premier home health agencies, we can help get your life back on track! Hiring our at-home care services can provide a number of benefits for patients who are in need of post-op care for their recovery. Today, we’ll cover a few basic positives that may help to make the difference between having a healthy rehabilitation and struggling to heal. After many major operations, a panoply of medications is sure to ensue. Being able to take care of yourself can prove to be a hard task to accomplish after going under the knife. With our trained home health nurses, the patient and family can rest easy knowing that the right oversight is in place to cover all facets of recovery. This way, you can focus on being comfortable and getting better. 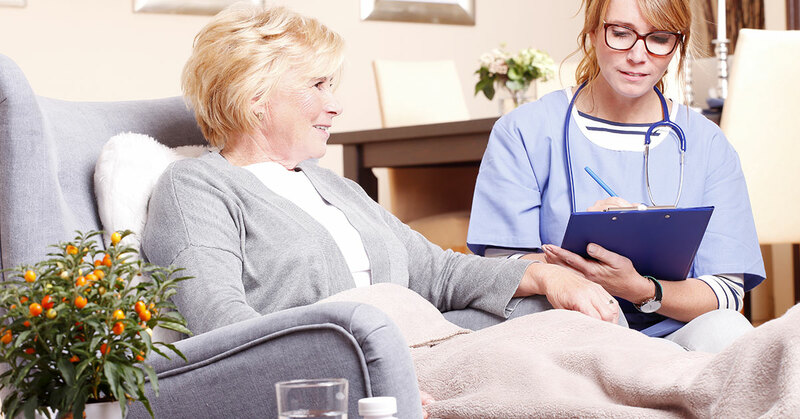 One major benefit of utilizing home health care is the satisfaction that one derives from being able to recover in the comfort of their own home. Not only do you have all of your possessions and loved ones in one place, you’ll also avoid the inherent risks that come with staying in a hospital. Despite the best sanitation practices, hospitals can be a breeding ground for infection and illness for those with already diminished immune systems. Staying at home with Mission Medstaff gives you the freedom to rest at your place while also receiving optimal treatment. Surgery can be an intense process for patients, and the first 24 hours of recovery are vital for promoting healthy healing. Special attention needs to be taken during this time for the administration of medication and checking the surgical site. Our staff of experienced home health nurses can be vitally useful during this critical phase for supervising and recommending treatment. If something is out of the ordinary or if a sudden complication arises, we can diagnose the problem and notify your primary caregiver for a quick resolution. This way, nothing slips through the cracks and the patient has every tool needed to recover. In need of elderly home care? Our staff has the training to ensure that seniors are treated with the best care possible! Recovering from an operation can be a lengthy, restrictive process. Many people do not have the luxury of being able to be lie in bed and neglect their obligations. Mission Medstaff provides highly qualified individuals to perfectly match with patients for the best care possible. Our staff will do everything in their power to make your life easier during this hectic recovery time. If you have questions or need assistance with anything, we’ll be glad to lend a hand. Mission Medstaff strives to give patients the health benefits of recovering at home and the support needed to minimize the length of the recovery process. Our one-on-one services are what makes us your Top Rated Local® home health care professionals! Major surgical operations can be the cause for much stress in the lives of patients and their families. Bringing in a home health nurse can do much to foster healthy recoveries and smiling faces. Being able to provide professional medical services, along with peace of mind for family and friends, is a key to our success. With so many benefits, it should be easy to see why we are so proud to provide our services to North Carolina residents. If you’re in need of home health care in Greensboro, we’re ready to help! Contact us today to learn more about our services!